Some people who believe the world needs changing point to endless growth as humanity’s choke point. They believe the Earth’s carrying capacity cannot sustain the consumerism inspired by capitalism. 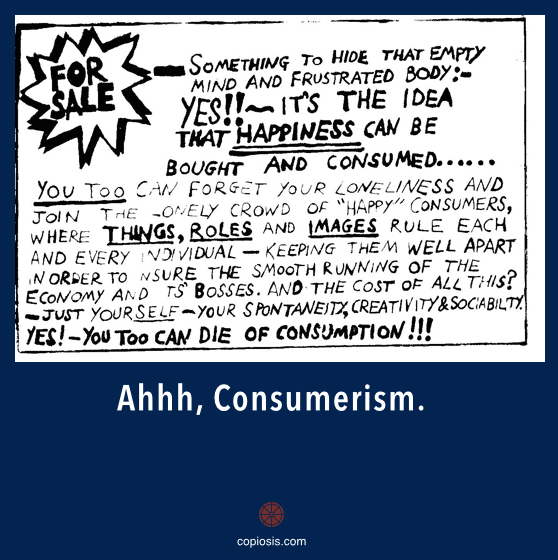 If that consumerism were to spread to other countries, which seems to be happening, we’d be in deep doo-doo, they say. Others say we are already in the doo-doo. I don’t think endless growth or consumerism is our problem, nor do I believe in the inevitability of deep doo-doo. As with seemingly everything, Earth’s carrying capacity depends on a huge number of factors, which is another way of saying it depends on perspective. Given these factors, estimates put the number of people Earth can sustain between 2 and 40 billion. There are currently seven or so billion on the planet today. You can read more about these numbers here. Dire predictions about Earth’s defilement and a future global SHTF scenario due to excessive consumption depend on a thinking I detail in the second edition of Copiosis: An Introduction due out sometime in the future :-). Those looking at the world as it is aren’t considering what will be. They’re trying, but they do so by looking at what is, which is always a mistake. As a result, they make predictions based on what they can measure. It is nearly impossible to accurately predict innovation and the success of same, let alone the natural future. Could you have predicted Twitter, the documented decreases in deaths from war and murder or the decreases in crime all around the world? Could you have predicted the eruption of Mt. St. Helens, the tidal wave that destroyed the nuclear plant at Fukushima, Japan, or the drought currently parching California? When there are big rewards to people who make and get [predictions] right and there’s zero punishment for people who make bad predictions because they’re immediately forgotten, that’s a recipe for getting people to make predictions over and over. Those who believe we must decrease our numbers or our consumption in order for humanity or the planet to survive are only considering life limited to the Earth and consumption as practiced today. They don’t consider life in other environments, such as other planets or space colonization. “But wait,” pessimists/realists will say. “These planets are light years away. We’ll never get there in time let alone develop the technology needed to make such a voyage. Nor have we developed the technology to allow people to thrive in space.” Maybe. Since innovation can’t be accurately predicted, we don’t really know. Could you have predicted the rise of at least two privately held companies that have successful investments in privately owned space transportation Technology that may lead to people living in space is already under development. All we need to speed this work up is to remove constraints preventing the exploration of such ideas. “No one will want to leave earth and live on a new planet or space station,” realists might say. What about the 2,000 people who applied for the Mars One mission? If that many people applied for what some think is a hare-brained idea, how many would for a legitimate opportunity to land on a real, habitable planet some many light years away or an orbiting habitat like that envisioned in the movie Elysium? There is no doubt in my mind humanity will eventually make it to the stars. In the meantime, there’s a lot that can be done on Earth operationally to bump our capacity closer the 40 billion number. None of these things has anything to do with curbing growth. One thing is to make efficiencies across the board possible that currently are constrained by the “we can’t afford it” paradigm. “Make … possible” doesn’t mean making them affordable, it means eliminating the affordability question entirely. Endless growth is not humanity’s problem. Earth isn’t limited in its carrying capacity. Neither is the Universe. What we need is not a way to restrain endless growth, but a way to unleash human imagination. What do you think? Is the Earth really the only planet capable of supporting life? Why do you think growth must be limited if you do? Why can’t everyone in every country enjoy lifestyles similar to those of Americans? Under what conditions would you be willing to live in space or on another planet?